Our new market scanner tool is now available in the members area. Look for the link just above the most recent trading plans. This tool scans the market for fresh market movements every 10 minutes. 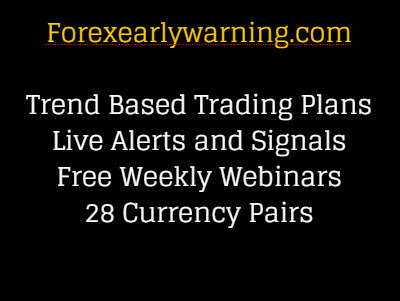 Forexearlywarning provides trend based trading plans, profitable live signals and forex alerts across 28 currency pairs. We trade with the larger time frames and trends of the forex market, H4 time frame and larger. The signal systems we provide include trend signals, specific pairs to trade from our trading plans, and visual signals from our live signal system, The Forex Heatmap®. Our subscription price is only $19.95 per month! This is a complete forex trading system. Total market analysis of 28 pairs and 8 currency groups, more exact trade entries, and a complete money management system is included. Our various forex alerts and signal systems include audible price breakout alerts, visual trading alerts, live currency strength alerts, and specific times listed on the world economic news calendar. The Forex Heatmap® is a visual signaling system for all 28 pairs we follow and provides real time trade entry management. The heatmap software is live on our website during market hours. Start My Subscription for $19.95 per month via PayPal or credit card. Or we can arrange to accept checks from a USA bank. Each trading plan is designed to put you into a swing trade or a longer term position trade while trading in the direction of the larger trends and time frames. Our daily plans are issued well in advance of the main trading session. You will always know what pairs are trending up and down, and where the price alert levels and breakout points are across 28 pairs. Our forex market analysis method is multiple time frame analysis. To follow the trends of the market we provide a set of free forex trend indicators. The free trend indicators can be installed on any broker charting system, including Meta trader. Traders can then start to set the audible price alerts that we specify every day in our plans for price breakouts of support and resistance. Our trading plans also give target resistance and support levels or hold recommendations based on the market conditions. Since we provide trading plans, forex alerts, and signals for 28 currency pairs, not just the EUR/USD and GBP/USD, you can introduce more pairs like the EUR/JPY, AUD/CAD and faster moving pairs like the GBP/AUD and GBP/JPY into your trading program. The trading plans, signals and alert systems can also be used by day traders. Our daily plans and price alerts, when combined with a strong entry management system like The Forex Heatmap®, will give you the necessary real time information needed to pinpoint all of your trade entries. Any trader who is interested in following the trends of the currency market will like our trading system. Follow our price alerts, market trends and heatmap signals like an expert. As a subscriber you will receive all of the following services for $19.95 per month: Fixed price of $19.95 per month, no add-ons or up selling, written forex trading plans, full time access to The Forex Heatmap® plus backup systems, live forex heatmap alerts on your desktop and mobile devices, trend indicators for multiple time frame analysis and setting audible price alerts, and all of our resources for learning the system including our 35 illustrated lessons, audio library, video library, and live and archived webinars on Monday and Wednesday nights, along with email, phone, and Skype support.